The Big Smooth actually had the lead over past multi-year champ Flyin' Bryan but any chance of holding him off for the championship seemed remote at best. First, Bryan's a great racer and difficult to beat on the best of days. 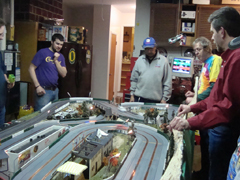 Second, the race was at Larry Cockerham's new Sling Shot Speedway which is a 1:24 scale track. Once again advantage Bryan. And since Monte would need to not only beat Bryan but do so by at least 3 points, the task looked impossible. Once the racing action started though it was clear that the track had changed from a sling shot into something more resembling pinball alley! And Bryan was just about to fall into that racing vortex where everything goes downhill. Fast. On a high-speed track like the Sling Shot it's crucial to stay out of trouble. And trouble can find you in a hurry. Heat pairings can make all the difference, a point never more apparent. This issue is heightened not just by the rapid rates of travel but high speeds coupled with occasional blind spots. Go into a corner hot and BOOM. "Dude, where's my car"? Where the Flyin' one was paired with a few drivers that seemed to take great glee in slapping a little plastic the Big Smooth got a more fortunate set of pairings and was able to spend most of his time worrying about making laps and less worrying about being the victim of traffic. At the end the real big daddy of the Sling Shot turned out to be the Karlton Kid, our host, Larry Cockerham. Larry out-dueled second place racer Dave Smith with both having the same number of laps but Larry was slightly further along the track. In a stunner it was the Big Smooth in third followed by Bart, Terry, Bill and finally, Bryan. The 2010 NASTE Championship goes to Monte who finished two points ahead of Bryan. The mailman, Terry Abbott claims third. 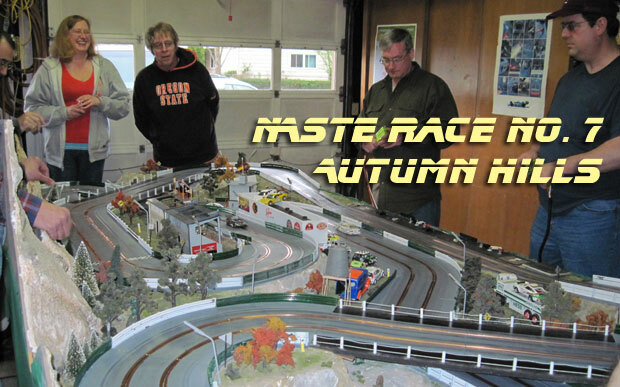 A small but spirited group of NASTE racers descended upon Autumn Hills Raceway in Milwaukie on Saturday, April 16th to engage in a series of spirited racing duels. Rico Locati armed the racers with Ninco's fine inline motored Mercedes CLKs, and Autumn Hills provided the racers with the technical challenge it is known for. Monte 'the Big Smooth' and 'Flyin' Bryan started the evening off with a rousing first heat tie. To the inch. It would stay that close for much of the evening. After all the straights were strafed, fenders were bashed, paint was traded, and the apexes were cut, 'Flyin' Bryan Trachsel was the last racer standing. A big thank you to Rico and Kelly for accommodating the last minute schedule changes to make this race happen. And a special thanks to Kelly for providing an excellent feast! 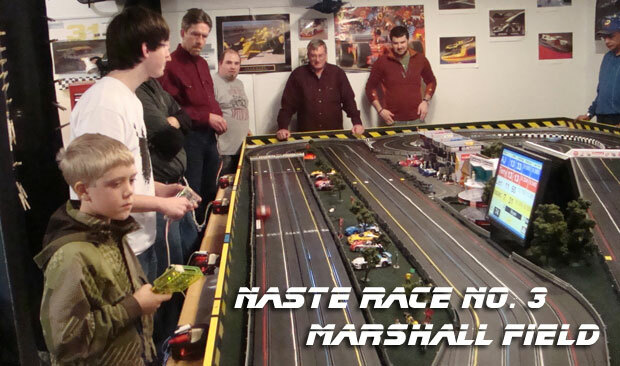 On Saturday, March 19th the third digital event in NASTE history was held at Monte and Victoria's Jacquelin Park Speedway - a three hour team Enduro. Seventeen racers to put the cars and track to the test. After an hour or so of getting used to the track, teams were arranged as fairly as possible. After a few minutes to come up with some clever team names, driver order was established, teams took to the track, the cars were placed on the starting grid and the flag was dropped. For the next 3 hours, mayhem would reign supreme. Teams learned that "kinking" a car too fast into a corner would pull the guide blade out. Soon, drivers were getting the idea and problems were fewer. And in typically NASTE spirit: "It's the guide!" "We ran it that way so we're not fixing it now!" Since the cars need to "re-fuel" about every 40 laps, we used that for driver swaps and it led to a veritable flurry of activity around the table. And on the track, the lead changed hands after each section. As it turned out, every lap would count. In the end, it was the Victoria's Secret team leading the way but it was a close race all the way to the finish. A mere 20 laps separated the field. A giant thanks from Monte and Victoria to all the racers that came out to join us in the fun. And we'd also like to thank all those that contributed to the success of the evening by bringing tasty treats and for fixing our sliding glass door. You know who you are and so do we! The fifth race of the NASTE season saw the return of two favorites of mine, the Fickle Fiats of Fate and racing under the lights. To top it of, there was also some close racing action going on among the amazing food display. It's always a fun night at Rico's. Those fabulous Fickle Fiats got the first set of the night started and quickly reminded us of their tempestuous nature as some of the drivers induced the Fiat bounce enough to dislodge a tire now and then greatly reducing the lap count. There's a joke about cars going wop-wop but you won't hear it here. Those Fiats have always worked well for me and I was able to get just a little more out of them than Flying Bryan to take the win squeaking by him by about half a lap. Battlin' Bill Bostic rounded out the podium in third slipping by the track owner Rico by one tenth of a lap. That's close! But there was still a second set to run. And there would be different cars and more chances. Who would make the most of it? And with three successive NASTE wins on the Autumn Hills track could the Big Smooth make it four? In the second set, Rico brought out some smooth-running SCX LMP cars. Since the cars are equipped with working head and tail lights it was decided to run in the dark with the track illuminated by the many lights placed around the track. It was a great time. And this time it was the track owner, Rico, breaking through with the win just barely getting past Bryan by a single tenth of a lap. Battlin' Bill was once again third this time followed closely by the Big Smooth another tenth back. Thanks to Rico and Kelly for a great evening on rather short notice. I particularly liked the sausage selection. And thanks to Dorothy "The Hammer" Abbott for making such great chocolate treats. I understand the little mice were quite popular. Tasty too! The next race is at Jacquelin Park Speedway at Monte and Victoria's in Hillsboro. The event will be a three-hour team Enduro on their digital track. We'll hope to see you there! The half-way point in the NASTE season was greeted by torrential downpours as the weather turned aggressive. But the real aggression was being displayed at Jeff Courtney's Hemi Heights Raceway this past Saturday as an exceptional field of nineteen racers turned out to do battle with Jeff's wild and crazy 1/24 scale Jalopies. They look great but handling is a little less precise and cornering speeds were slow and treacherous. After the first set it was Jeff in first with Flyin' Bryan in second and Dave Smith in third. Would Jeff be able to hold the lead and turn in another owner fueled win? In between sets, we did what NASTE does best - EAT! Jeff had the hot dog grill on full stun and Dorothy had once again provided a tasty selection of treats. Back at the track for the second set, racers were getting serious and starting to adjust to the Jalopies tendencies. And this time there was a shakeup in the standings as Flyin' Bryan came through in first with Dave Smith in second and Jeff falling to third. But it would not be enough to get Bryan his first win of the season as Jeff's first set lead held up for another track-owner win. Bryan finished second and Dave was third. Following close behind was Rico, Terry and Monte. The distance between first and seventh was less than a lap a heat. Thanks to Jeff, Jake and Cathy and all the others that brought food. The next race is at, ok we're not sure where it's going to be held but we'll let you know as soon as we do. Brightly lit Christmas decorations provided a festive greeting to racers as they arrived at Randy Stumman's Marshall Field. A great crowd of eighteen racers came out for the third race in the 2011 NASTE series. In the first racing set of the evening, Randy treated us to some fast and furious Ninco coupes. Racers worked hard to bring the Ninco magnet-rockets under control. And once again the home-track advantage came into play as Racin' Randy turned in the top performance and finished nearly four laps in front of the field. Clawing and scratching for everything they could get was Monte in second, a scant 4/10 of a lap ahead of Flyin' Bryan. In between sets, we did what NASTE does best - EAT! Myrna brought out a great stack of pizzas and other goodies and we ate until someone decided maybe we should do some more racing. A super-big thanks to Myrna for feeding us. It was really great. For the second set we had more Ninco's but this time it was the McLarens from the previous race at Penguin Point. Set up simply from stock by removing the magnets and changing the tires, the cars were a little slower but a little easier to handle and perhaps drivers were a little more cautious after the first set but suddenly racing was close. Really close. The Big Smooth put down some strong numbers in his first three heats but rotated out and wouldn't come in until the final heat. In the meantime the leader board got a workout as Bill took the first serious lead only to be replaced shortly after by Racin' Randy. Then Rico got it in gear and stormed into a lead of more than a lap. And that lead would hold up until the final heat when Monte slipped by for the win. This time there were seven cars within four laps of the leader. Thanks to Randy and Myrna for hosting a great race and all the others that brought food. What would a NASTE race be without Dorothy's chocolates. Yum! The next race is at Jeff's house in Portland. Will he make it 4-for-4 for track owners, or will someone break this vicious cycle? Only time will tell. Penquin Point was the place to be for the second race in the 2011 NASTE series. Monte provided some great cars, Victoria provided some great food and Dorothy brought treats for a special taste-test. We had 12 drivers who gave the cars and track a good workout. This was possibly the smoothest event I've attended as there was never any downtime for track or car repairs. The only casualty was the continuous battering of a little track marshal and the hay bales he was trying to hide behind. After two rounds of racing, home track owners are now 2-for-2, as The Big Smooth finished on top. A few racers had 24 lap heats, but Monte was the only one to post 25 laps in one go. Flyin' Bryan was a close second and Dave Smith rounded out the podium. If those three had just skipped a heat, I'd be the winner! The next race is at Randy's house in Beaverton. Will he make it 3-for-3 for track owners, or will someone break this vicious cycle? Only time will tell. The first NASTE race of the 2011 season was held Saturday at the Jeff Courtney's Hemi Heights Raceway Park in northeast Portland. 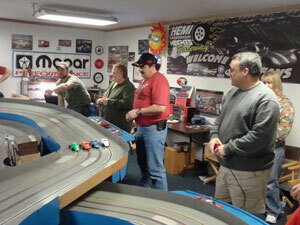 Hemi Heights is a 4-lane wood-routed track offering great racing for 1/24 scale cars. 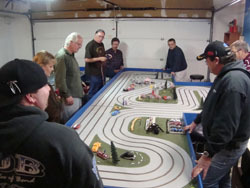 A great group of sixteen racers showed up to put Jeff's set of IROC racers through their paces. 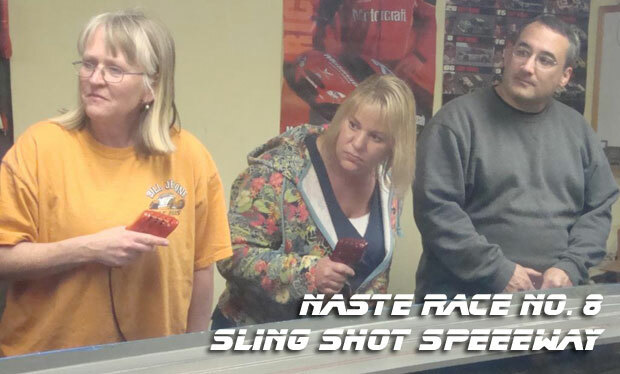 The NASTE cars are not extremely fast (being powered by RadioShack motors), but they are challenging and fun to drive! The cars slip and slide around and it's a challenge to take a corner at a high rate of speed. Crashes were rampant as drivers laughed their way through two sets of heats. Its fender slapping at it's very best in the true NASTE tradition. The racing proved to be very close and as the evening progressed, Jeff Courtney came out on top to claim the win just squeaking by Flyin' Bryam in second and Dave Smith in third. In fact the top four racers were separated by slightly more than one lap. Thanks to the Courtney's for a great night of racing!